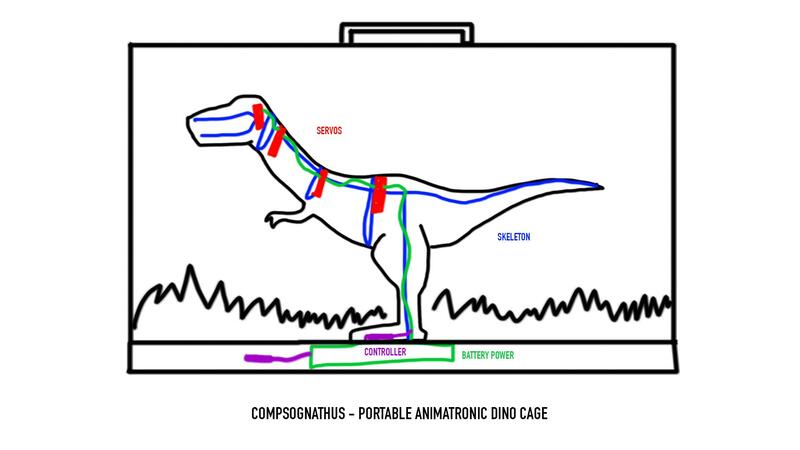 Hey guys, a camp I work for wants to produce some simple animatronic Dinosaur effects. I've done some research, and I think I have a good grasp on the process. However I'm more artistically minded than mechanically. Sculpting and painting are in my wheelhouse, but not so much servos and circuit boards. Can anybody help me out with a step by step process to get me started. Here's a blueprint I cooked up, would anybody be up for helping me fill in the details? Like how the servos and stuff would actually interlink and work together? Stuff like that. I'm thinking aluminum for the frame. At minimum I'd like two points of movement on this little guy, up and down for the jaw and base of the neck. But If I'm being ambitious, I'd also like it if the head could move side to side where the head connects with the neck. I didn't even plan this far ahead, but an added bonus would be blinking eyes, and a tail swivel. I'd like to program him to just act on a loop, which will just start up when the power is switched on. Nothing fancy like motion sensors or extra triggers. In a perfect world, the cage would be no bigger than a 1.5 feet in width, and about 1 foot in height, but I'll make it as big as it needs to be to work well. He needs to be easily transportable, and preferably not very heavy. Any tips you could give on servos, chips and batteries would be super helpful. Also, I'd like to make this thing as cheap as possible while still maintaining a spirit of excellence. What servos you go with depend on how much force is needed to move the parts you want to move, how fast they need to move, how much space you have to house the servos, and how much money you have to spend. I would try and design your character around basic hobby store servos. You can also house the servos externally (in the base of your cage) and run cables (similar to bicycle brake cables) into the body through the legs to control things. This is often ideal because it means you are just moving the character, not moving the character and the added weight of all the servos inside it. The cables used for RC aircraft work great in animatronics, and are what I'm using in one of my current projects. To control your servos you can use an application like VSA (Visual Show Automation) which is not very expensive: http://www.brookshiresoftware.com/vsa_overview.htm But it requires a computer (like a laptop) to run. Determine the scale of the character and cut a scale mockup of the profile out of a material like cardboard, to be used as reference. Using the reference from the previous step, fabricate an articulated metal skeleton for the character that incorporates all desired movements. You want to keep it light weight, but also rigid enough that you don't waste any of the servo's energy on unwanted motion. Test the movements by manually moving the cables, and add springs where resistance or auto-return/center behavior is desired. Springs can also help prevent unwanted wobbling of articulated features. Build a small block that all of the servos can mount to, allowing enough room to link the cables to each servo. Fabricate a base that the articulated skeleton can mount to, that can also house your electronics and block of servos. Connect the servos, servo controller, and Arduino, and power everything from the wall to start. (6v DC) You can move on to batteries once you know how many amps all your servos draw when in motion with the skins. Start programming the character's movement, and carefully set limits so you don't over extend any of the servos. Build a rigid hollow core that holds the skin in place, and can be attached to the mechanical structure of the character. This can be fiberglass, vacuum formed plastic, fabricated from styrene sheets, etc. Apply the skin and test everything for movement. You will find the servos now require more amps to move everything, as the skin adds resistance. Also make sure you can remove the skin to service any of the mechanical linkages inside the character's body. Fine tune all the movements and program your desired performance. I also suggest checking out Rick Lazzarini's lesson series on animatronics, as it helped me a lot. If you have other questions I'm happy to help answer them here on the forums, and please share your progress with us! Quick added note: I would try to keep things as simple as possible by limiting the movements to those with the most impact. Finer movements like blinks and eye movement really bring a character to life, but are the most complicated and difficult to pull off. Starting with just basic head and body movement will also help keep cost and time investment to a minimum. If you can, I would try and take an iterative approach to the character. Make version 1 with only the most basic features/movements, and then add more to it over time. Also look at Cable Mechanisms by Richard Landon has a lot in info re flexible joints and tails/necks. Hey Evan, How is the Dino project coming along? Just saw this thread and figured I'd see if you need any help. Chris suggested VSA as a control system. If you choose to go that route, I've been using that software for about 10 years and it does a good job on control synced with a soundtrack. All the lessons people have suggested so far will be a great start to get you on your way!